Despite my proclamations on the internet that I am #notatechie, I have actually been an early adopter of a couple of technologies. Shocking, right? My husband and I bought a personal computer in 1991. That thing was a behemoth. So heavy. And very expensive. Each component of the computer had to be purchased separately. No bundles of monitor/harddrive/keyboard/mouse back then. No convenient Best Buy or Costco as Best Buy wasn’t open and Costco didn’t sell computers. We bought from a computer store where we had the tech custom make our PC. 80 meg hard drive. Ouch…how ever did we save anything on the hard drive? As the arrival of baby #1 loomed in 1995, my husband was insistent that we needed a cell phone. No ifs, ands, or buts. We purchased that monster cellphone from the Verizon store, which back then was called something else. Plus, my husband and I shared one cell phone. My kids cannot wrap their minds around sharing a portable electronic device. I recall that whoever was out with the baby carried the phone. The phone was a chunky, weighty, no frills phone with a carrying wrist strap. Though there was no way either of us would have lost that phone! By the late 90s, my husband got his own cellphone. We used the cellphone only for calls. Neither of us activated texting until much later. But, we had cell phones when many of our friends did not have them. My husband likes to think of himself as tech savvy. He’s a lover of gadgets, too, but I had a smartphone before he did. He was quick to jump on the smartphone bandwagon after me, but as I like to point out it was the #notatechie one in the family who had the first smartphone! Once we had smartphones, we would look at each other and wonder how we survived without them. I know, I know I’m exaggerating just a smidge. But the smartphones are an essential communication tool. We text constantly. Updating each other on the afternoon pickup plans. Weighing the pros and cons of who will pickup Child #1, drop off Child #2, and hang out with Child #3 at home. And each day we have another conversation to figure out how we will drive #1, #2, and #3…which parent will do the driving. Ugh, these calls are endless. Taking video at an event in D.C. using the Windows 8X by HTC. Founder of Hot Legs Salon Products,, Gayna Elvin, explains the benefits of her wax products. Without the ability to text and email, we would have had to rely on landline phones. I work from home, but I’m often out and about during the day. My husband works in a school and cannot always be reached by phone. Texts, emails, and phone calls give my husband and I the flexibility to plan, schedule, and manage all the family activities. We can contact each other on the go. Plan for who will pick up or drop off. Smartphones are an essential part of our family’s ability to communicate. Smartphones are a key communication tool for our family. If you have a basic phone and are thinking of making the switch, trust me you won’t regret moving up to a smartphone. Having access to family is so important. My teens use iPhones, while my husband and I use Android platform phones. We’re all happy to have smartphones, that is for sure. Though I am happy with my phone, I do love learning about a new technology. One technology that I keep hearing about is the Windows platform phone. Reading posts and tweets about the new Windows had me intrigued. I may not be a techie, but I love new tech gadgets. Remember I’m an early adopter! I was asked by HTC to give the Windows 8X smartphone a test drive. I rubbed my hand together gleefully when I heard I would get a chance to try out this new phone. I heard that Windows phones were easier to use. I wanted to see if that was true. Have I mentioned that I am #notatechie? I have a hit or miss method for using gadgets. I get it done, but it’s not pretty. Out and about in Washington, D.C. snapping pics — The Washington Metro…breakdancing on a street corner…Chinatown. I enlisted the help of my team…husband, kid, and two teens…the Musings from Me Review team! I’m better when I bring in the real techies. The kid wasted no time downloading and playing games. So what did he play? I should probably list the games he did NOT play! He played Bike Mania Free…Motorcycle Mania 2…Speed Up…Top Truck Free…Wizard’s Tower…and more. That kid had a good time! I didn’t connect to the XBOX as I kept forgetting to grab the log in information. I used the phone’s camera A LOT. I was constantly reaching for the phone. I snapped pics at home, on a day trip to a business event in D.C., on a trip to Philly, on a carpool run to school, and just vegging at home. The touchscreen was a dream. A slight graze of my hand on the screen and I was able to open the phone. A mild tap and an icon opened. No more scraping and dragging of fingers and thumbs on the touchscreen. My major pet peeve is how nonreactive touchscreens can be. 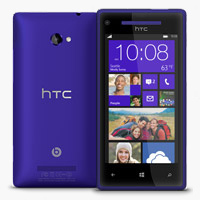 From a purely aesthetic perspective, the Windows 8X by HTC is a pretty phone. The bright blue back cover is striking. I like that the front of the phone has a nice border of bright blue. Looking at the phone made me smile! Oh, and the sound quality is marvelous. Studio sound quality with built in Beats Audio. I’m no iTunes guru…unlike my kids and husband, but I do have a handful of songs on iTunes that I intended to download to my old iTouch. Sadly, the iTouch is so old that the operating system is very out of date. I was pleasantly surprised that I was able to download the Les Miserables soundtrack and an assortment of Rascal Flatts and Sugarland songs to the Windows 8X phone. Love having music for waiting in the carpool line. Final thoughts…I would highly recommend this smartphone to just about anyone…new user, veteran smartphone user, teens, mom-on-the-go, super user. From the sound quality of Beats Audio to the games for the kiddies, the phone has many qualities for the whole family. Built organization apps help increase productivity…OneNote for notes and lists, Microsoft Office with its SkyDrive for documents and memos, Calendar, Calculator, and many more round out the Windows 8X by HTC. I was not compensated for this post, but was sent a phone for an extended review period. The views expressed in this post are my own. I follow the tenets of Blog With Integrity. ← Wordless Wednesday: Medieval Times!